Even on a damp, chilly evening, I prefer the back patio at Stanley’s — and not just because it’s closer to the bar. I like my beer and brisket with a view of the big mural painted on the back wall. 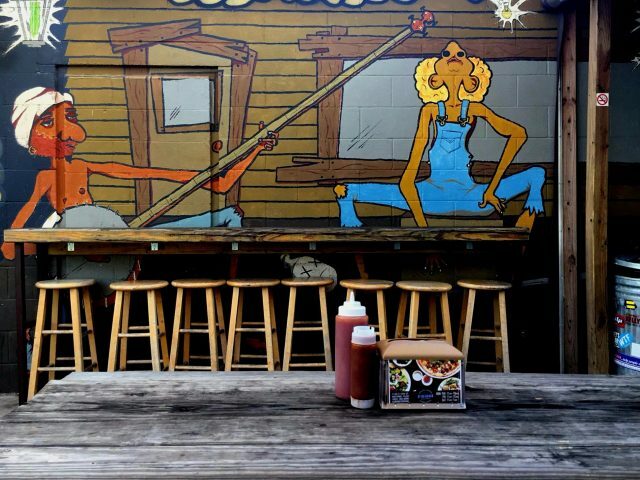 I fell in love with the painting on my first visit out to Tyler several years ago; it’s goofy and cheery and makes you feel like you’re eating in good company even when you’re tucking into a Mother Clucker all by your lonesome. I’ve always wondered about the story behind that mural, and a few weeks ago I finally met the man responsible. Joshua David Keenan is a Longview-based plumber by day, artist the rest of the time. He’s lived in East Texas on and off his whole life, and spent countless nights over the years at Stanley’s, for the food and drinks, of course, but especially for the eclectic mix of live music. A detail from Keenan’s mural. Courtesy of the artist. One night about ten years ago, Keenan was hanging out back at Stanley’s with some buddies, including Stanley’s co-owner Nick Pencis. This was well before the back patio was renovated into the homey rustic space it is today. 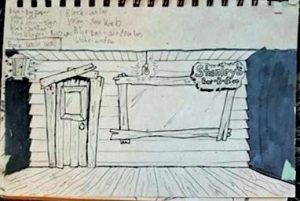 Early sketches of the Stanley’s mural. Courtesy Joshua David Keenan. 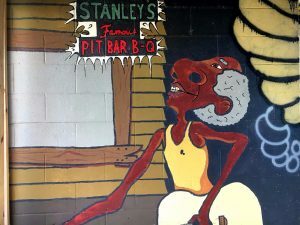 Keenan also wanted to reflect the fact that musical genres popular at Stanley’s, from blues to rock to bluegrass, were originally fueled by people living in poverty. 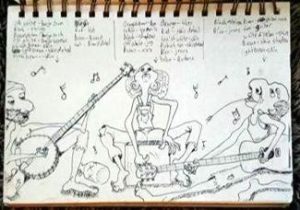 His musicians lean on a rickety shack, dressed in loose rags and plucking what look like handmade instruments. He worked by himself on the mural for about a month, on nights and weekends. Pencis paid him in food and beer along the way, and a few hundred dollars when the painting was done. The worm-like yellow outline around Keenan’s musical motif was added later, by local artist Nora Schreiber, while Keenan was off living in Denver for a few years. (He used his mural earnings to fund the move). “I don’t mind it,” says Keenan. “I’m all about art evolving into something else.” He likes Schreiber’s work; she once painted a mural outside a local tattoo shop he used to own. Since then, he’s also painted a number of smaller signs around the restaurant. 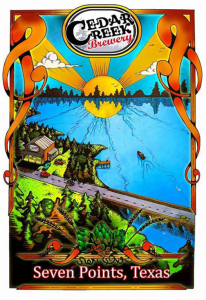 Poster for Cedar Creek Brewery by Keenan. Courtesy of the artist. This summer, he’ll be be painting a mural in the cafeteria of a Longview middle school where his wife Kate, an educational diagnostician, works. “The school is underfunded, and the kids need something motivating,” he says. He’s planning to depict kids dressed in the uniforms of all sorts of professions they might be interested in, both “far-reaching and practical,” from astronaut to plumber. He’s also done murals for a few marijuana dispensaries in Denver, and a poster for Cedar Creek Brewing Company in Seven Points, Texas. Did you learn something new from this story? If you believe in the power of local journalism here in Tyler, I'm hoping that you'll help us take The Loop to the next level. Our readers have told us what they want to better understand about this place we all call home, from Tyler's north-south divide to our city's changing demographics. Power, leadership, and who gets a seat at the table. How Tyler is growing and changing, and how we can all help it improve. Local arts, culture, entertainment, and food. To tell those stories, we're hoping to add 50 new members this year. For $15 a month—the cost of a nice lunch—you can significantly increase our ability to do the big, hard-hitting, complex Loop stories and interviews you know and love in 2019. We can't do this alone. If you believe in a more informed, more connected, more engaged Tyler, help us tell the stories that need to be told in our community. Get free access to select Loop events, behind-the-scenes updates about the impact and goals of our work, and, above all, a chance to play a part in bringing more fresh, in-depth, unexpected journalism to Tyler. Tasneem Raja is the Executive Editor of The Tyler Loop, a nonprofit journalism startup that explores policy, history, and demographics in Tyler, Texas. She is an award-winning journalist who has reported for NPR, The New Yorker, the Atlantic, Mother Jones, and other national outlets. A former senior editor at NPR, she launched a popular podcast exploring issues of identity and race with NPR's Code Switch team. At Mother Jones, she specialized in data visualization and led a team that built the first-ever database of mass shootings in America. She's a pioneer in the field of data-driven digital storytelling, a frequent speaker on issues of digital journalism, and a die-hard fan of alt weeklies, where she got her start as a local reporter. She lives in Tyler with her husband, her stepson, and two imperious terriers.